I want to personally thank all that came out last night to our opening at The Meeting Place. 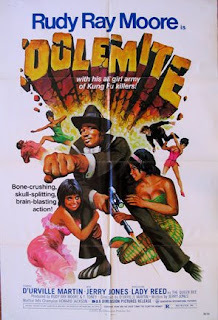 Dolemite is a most excellent film when shared with a mixed audience. I wanted to have a Boom Mike Drinking Game but it was our first night and I wasn't sure if it's legal or not. Hopefully, the cackling woman won't be there next week. Thanks to Roberto for letting us use the space.